This blog post explains how you can use geolocated time tracking to organize your work force, your working hours as well as your different projects. We have designed a solution for time tracking which can be applicable to teams, small businesses, large businesses, agencies or individuals - in any industry. Our solution is powerful and facilitates administration so you can focus on your core business. With our designed solution it's possible to know the time spent and the exact location of your employees, simply by using GPS. By creating a geofence around a specific point or area, such as a work site, employees will automatically be tracked when entering the area. The time span will automatically end when the employee leaves the area. We will use a Home care service company to illustrate our design. 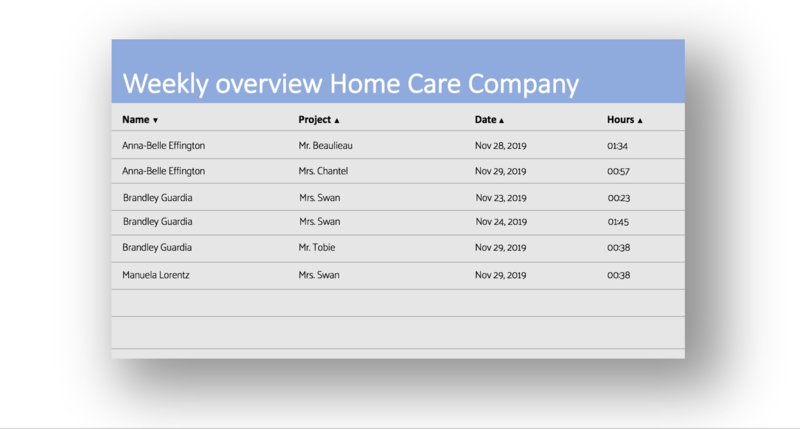 In this blog post, we will use the scenario of a Home care service company to illustrate our designed solution. We will illustrate how the general time tracking could be used, how to achieve an overview of your employees and projects as well as additional integrations. This will show how Matchmore can solve the problem of attendance and employees' performance while working remotely. The presented solution can of course be applied to other industries and companies. One of the main challenges of companies with remote workers is to track them efficiently without restricting their privacy. This involves many parameters to be taken into consideration such as the working industry, the need or not of real-time tracking and the sensitivity of some information. Tracking employees can be very useful, but it can also sometimes be difficult. One the best advantages of employee tracking solutions is the potential increase of productivity for the company. For companies with set offices, time and money can be saved by such a software. This will avoid the employees to Cyberslack! Cyberslacking refers to an employee’s use of work computers and other resources during work hours for non-work-related purposes. When an employee is cyberslacking, he or she will generally use these resources for personal affairs and for entertainment purposes. Additional advantages of employee tracking solutions are the ease of managing the payroll based on the time spent on site, fair employee treatment based on their attendance as well as reducing the unplanned absences. One disadvantage of these solutions could be concerning privacy. However, since the employees will be tracked based on their location with their consent, there is not a problem. In order to add productivity to the company while guaranteeing the employee privacy, we have designed an all-in-one solution, It's easy to deploy and easy to use both for the employees and the employers. Our solution adds the location context to the company's tracking software and can be plugged into the company's workflow. We provide a cloud service that can be used on the large majority of platforms. We offer a simple yet powerful and flexible programming model with scalable execution and an efficient cost model. This solution can be used in many industries such as construction, transports, telecoms, education, etc. Illustration of Matchmore's designed solution for time tracking. The employee will use his or her mobile phone as a GPS device. Since there is a virtual geofence around the building, the time will automatically start when the employee enters the building. When the employee exists the building, the time will automatically stop. The information will be registered automatically and visible for managers and the administration. In a remote working environment, communicating with the team is essential both for the employees and the manager. Due to many external factors, planning a visit to a patient may come with a delay or with a lack of information, and might be inconvenient for the employee. In order to get rid of this problem, our solution allows to synchronize in real-time the patient schedule and the employee. The solution can even go further by automatically assigning a patient to the nearest employee who satisfied some criteria required by the patient (work experience, availability and rating). Once a match is made, the employee, the employer and the patients will be notified on their mobile phone with a simple push-notification. The working plan can be added automatically to the employee and the patient agenda and a reminder can be set up. Thanks to the automatic time tracking, it's possible to get an overview of each employee, project and time. This data will be automatically registered thanks to the sensitive geofences around each project's work place. The data will be available real-time for managers and the administration. Thanks to our time tracking solution, your employees will experience a hassle-free time reporting, and can instead focus on their core tasks and what they are specialized in. Also, you will receive a better picture of the workforce. In this way, you will be able to plan your organization and your employees in a more efficient way. The software that we develop are meant to be used for either small businesses with few users and huge corporation with thousands of users. With a cluster made out of 200 virtual machines, we can process up to 80.000 location updates per second for 100.000 moving publications and moving subscriptions, thus producing up to 25.000 matches per second. Regarding many factors such as the company's size, the budget and the needs, we can develop, in a short amount of time, a light version of an app that matches the basic requirements. For internal use, after receiving the information needed, it's possible to easily generate some reports. The reports can be used for accounting or establishing a list of employees based on their projects. The app must be linked to a desktop admin panel which will monitor the mobile device and send the employees' missions right through the panel. The patient position could be editable on the admin panel and set up as virtual pin point to facilitate the geotracking. The data collected in real time can be stored in a local or remote database and exported according to the company's needs. 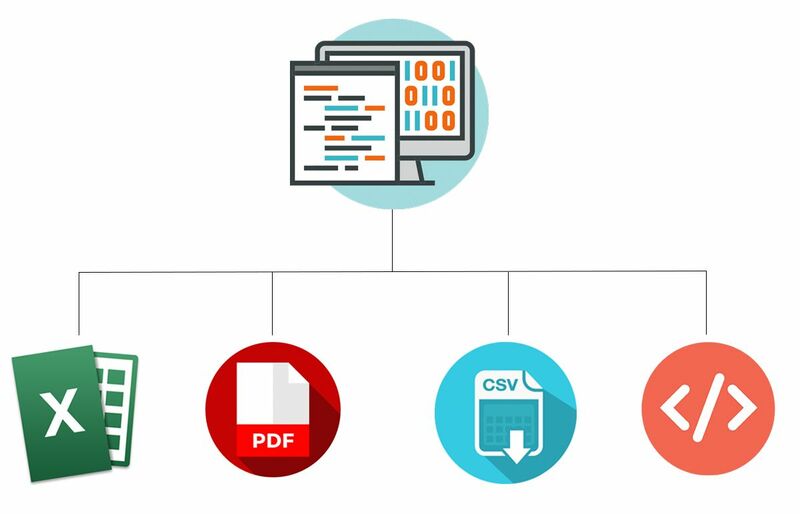 By default, the admin will be able to export those data in CSV, XLS and PDF. Some big companies tend to use a personalized ERP or an all-in-one CRM solution to monitor their patients and employees. With our solution, we provide multiple tools which may form an ecosystem of connected devices. Each of the component may be used individually, with their specific protocols. With our cloud-based solution, we guarantee you a simple integration in your existing solution. This can be made by developing some plugins in one of the programming languages that we support. Tracking employees could be an issue if it's done without consent. However, if the employees start the app and the tracking himself/herself, there is not an issue. You can read more about tracking employees, GDPR for the EU and consent here. If you are interested in how it works with tracking employees and consent in the US, read this article how the federal laws could matter. Are you interested in a time tracking solution for your business, feel free to contact us or contact our colleague Mitch directly at michel.demarsano@matchmore.com.